A knight’s armorial insignia were depicted on his shield and surcoat, and the crest was an ornament borne on his tilting helm; but the knight did not wear his badge upon his own person. It was worn by his followers, together with his livery colours, and it was always a simple figure which could be easily recognised. It was embroidered on the front or back of his tunic, or upon the sleeve or cap. The badge did appear, however, on the knight’s standard, which seems to have to a great extent displaced the banner of arms previously used by the king and his barons and knights banneret. It came into use in the second half of the fourteenth century and its use was more general in the following century. Varying in length according to the rank of its owner, the standard was the rallying-point in battle, and stood before its owner’s tent in camp. 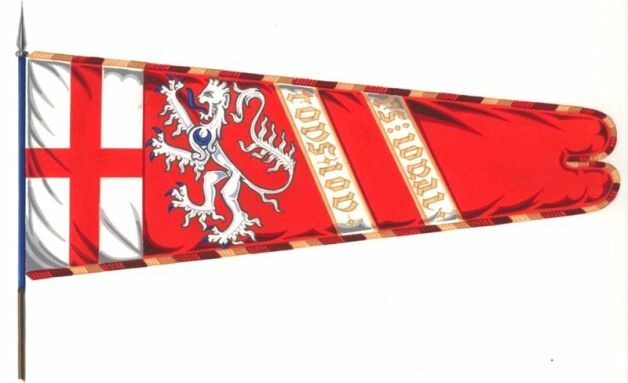 The standards of the sovereign, his earls and barons, and his knights banneret were longer than those of the knights, which were four yards long ; in fact, the king’s standard borne in battle was twice the length of that of a knight, and the one placed in front of his pavilion was as much as eleven yards long. Standards were much used for ceremonial and parade purposes. A knight’s standard was borne in the funeral procession after his death, and it was afterwards placed above the grave in the church in which he was buried. The national device of the red cross of St. George appeared on a white ground next to the staff in medieval standards, and on the rest of the ” field ” or ” fly ” appeared the owner’s badge — or badges, if he had more than one. The fly was usually divided into compartments by a couple of diagonal bands carrying the motto, and its field was tinctured with his livery colours, being divided fessewise, or into three or four bars. Many families have obtained the grant of a badge and standard since then (though their number is small in comparison with the number of families which have obtained a grant of arms in the same period), but the number of corporations to do so is little more than a score. Eight of these are local government bodies, several of which previously possessed arms, and of course badges and standards are granted only to those families or to corporate bodies which already possess heraldic arms or make application for arms when asking for the grant of a badge. It will be noticed that the modern standard does not display the national device, but bears instead the arms of the family or corporation which has received the grant of a badge. 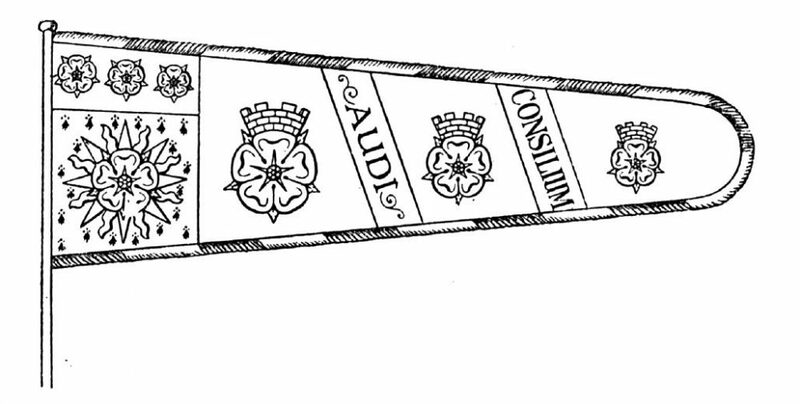 The standard of the West Riding County Council (the only county council to own a recorded badge and standard) has only one colour for the fly, this being “gules.” The standard is sometimes shown slit at the tip, but it seems not to matter whether there is a slit or there is not. Each modern standard has a fringe of the livery colours. 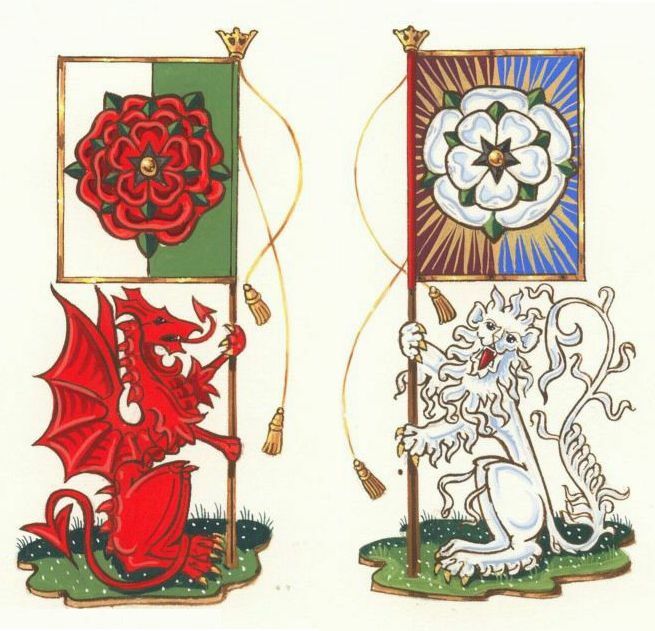 The West Riding’s is of argent and gules alternately. A student of heraldry will have no difficulty in colouring the illustration correctly. The motto bands should be left white. 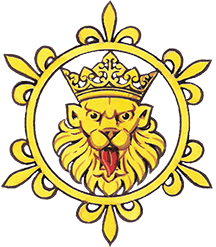 If the owner of the badge possesses a crest, he displays the crest as well as his badge on his heraldic standard, usually in the middle compartment of the fly, but the West Riding Council has no crest. The granting of badges and standards to civic authorities has been discontinued at the request of the Home Office, but any other kind of corporation may obtain a badge and a standard. The civic bodies which have been allowed a badge are: Launceston (1907); Exeter (1907); Bradford (1908); Sydney, N.S.W. (1909); Nottingham (1911); Llanelly (1913); Hertford (1925); and the West Riding C.C. (1927).